The practice of acupuncture provides a rewarding and successful career path to those interested in the world of ancient Oriental medicine. Regardless of where you want to take your career, the first step is to get a quality education. But how do you know where to go? Are there specific aspects that make one school better than another? 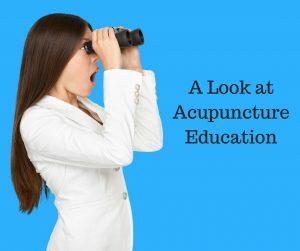 Finding the right acupuncture school is easy if you know what to look for. If you’re like most people, you’d like to go to a school that’s near where you live. On the other hand, perhaps you’d like to make a big change and go someplace new. You may want to consider choosing a program in the state that you plan to practice, as it may better prepare you for the specifics of obtaining state licensure. Also, you may find that the local alumni network is of benefit to you as you prepare to practice after graduating. No matter where you land, the school must be accredited. Accreditation Commission for Acupuncture and Oriental Medicine (ACAOM) is the accrediting agency for acupuncture schools in the U.S. The minimum requirement of prior education as mandated by ACAOM to enter any acupuncture program is 60 college credits. Individual acupuncture schools will vary as far as their individual academic pre-requisites, many schools require 90 credits and some western bioscience courses to enter an acupuncture program. It generally takes about three years to earn a degree in acupuncture. If your job, family or other obligations threaten the amount of time you’re about to commit to your education, be sure to find out what the school offers in terms of work-life balance. Many schools offer programs that have rolling admissions which allow you to begin on your terms rather than waiting for the typical fall start. A quality education isn’t cheap, but you’ll find that the investment in your career will be well worth it. If costs are a concern, look for a school that takes financial aid or offers scholarships. In order to succeed in your acupuncture career post-graduation, it’s critical to have a thorough grounding in many areas of study. Look for a school with a curriculum that has a balance of Eastern and Western medicine as acupuncture is not an alternative medicine but rather a complementary one. Also, the clinical internship hours and practice management courses play a very important part in giving a student the tools to open their own practice, so when looking for a school, consider how many hours of education are dedicated to these courses. There are plenty of schools out there that claim to offer the knowledge you need to have a career in acupuncture, but finding the right one for you takes some research. Use these tips, and you’ll be ahead of the game.